£5 Off Orders Over £30 at Everything 5 Pounds If you're spending £30 or more, you're in for a treat! Use this code for £5 off today. 5% Student Discount at Everything 5 Pounds If you are shopping on a budget, check out great deals at Everything 5 Pounds! Women's Dresses for £5 at Everything 5 Pounds - Includes Jersey, Tunic, Maxi Styles and More You can never have too many dresses and at Everything 5 Pounds it's not going to cost you much! Women's Sandals for £5 at Everything 5 Pounds Now that the weather is warming up, it's time to get some new sandals! As you know, everything is £5 at Everything 5 Pounds, so find your favourite style for £5 now! Men's Trainers, Sandals and Boots for £5 at Everything 5 Pounds Make the first step into a new winter wardrobe with men's shoes from £5 at Everything 5 Pounds. Women's Party Dresses for £5 at Everything 5 Pounds Dance into the night with party dresses at fabulous prices at Everything 5 Pounds! Kids Clothing and Footwear for £5 at Everything 5 Pounds Get them some new clothes that they will love for just £5 at Everything 5 Pounds. Home and Living Orders for £5 at Everything 5 Pounds Update your home with some beautiful new furnishings for just £5 at Everything 5 Pounds! Women's Bags, Scarves and Accessories for £5 at Everything 5 Pounds In need of scarves for those chilly evenings? Or perhaps after a new handbag? Look no further than Everything 5 Pounds. Men's T-Shirts for £5 at Everything 5 Pounds Get some quality new styles into your wardrobe for a bargain price at Everything 5 Pounds. Men's Jeans for £5 at Everything 5 Pounds A new pair of jeans won't set you too far back at Everything 5 Pounds! Women's Jackets and Coats for £5 at Everything 5 Pounds You know the drill... everything really is just £5! If you’re a saving-savvy style fanatic always on the hunt for a behemothic bargain then Everything5pounds is the holy grail for you. 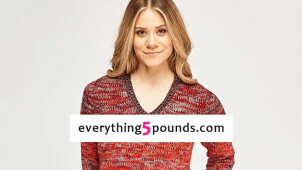 With a tremendous selection of stylish clothing, footwear and accessories, all available for just five British pounds, Everything5pounds is a truly terrific online store. Whether you’re after some new jeans, a new cardigan, some sunglasses, a blouse, a pair of high heels or a multipack of socks, everything on offer from Everything5pounds costs just a fiver, so you won’t be breaking the bank when you treat yourself. Since setting up shop in 2010 Everything5pounds has grown to become one of the UK’s favourite online bargain sites, with well over a million customers and a regular rotation of great-value wares on offer. If you’re looking for truly sensational value on an extensive collection of timelessly stylish clothing then look no further. Both your wardrobe and your wallet will love what’s on offer from Everything5pounds. How do I use my Everything5pounds promo code? Keep up to date with the latest deals from Everything5pounds by signing up to its mailing list. Do Everything5pounds have a blog? If you’re looking to stay up to date with all the latest fashion news and stay ahead of the curve you can’t do better than the amazing blog from Eveything5pounds. Is Everything5pounds’ stock poor quality? Everything5pounds has a simple mission; providing high-quality clothes at affordable prices. It feels not just the rich and the famous deserve to dress well, and as part of this it doesn’t compromise on the quality of its clothing. Do Everything5pounds have any physical stores? Everything5pounds is an online-only entity, and by keeping its overheads low and not shelling out for expensive showrooms it can keep its prices phenomenally low. Items can be returned to Everything5pounds within 14 days of delivery. If you love an unbelievable bargain you’re going to dig what’s on offer from Everything5pounds. With this great fashion retailer the clue is in the name - everything costs just five pounds! From jeans to jackets, pick up an Everything 5 Pounds promo code and get amazing value across the board. Update your summer wardrobe for less as you embrace wearing bolder colours, lighter outfits and complimentary layers everytime you step outside with Everything5pounds. Everything5pounds isn’t just about stocking high-quality, great-value clothing, footwear and accessories, they also offer a great range of fun, funky and affordable homeware. Stock up your home for less with Everything5pounds. From cup-and-saucer sets and citrus juicers to selfie sticks and eco cups, you can pick up everything you need to tackle the summer here. With everything priced at just five pounds, you can afford to be carefree! Pick up a brand new bag for the summer season with something from Everything5pounds’ amazing range of handbags, tote bags, clutches and shoulder bags. Bags are so crucial to everyday life, but treating yourself to a nice new bag needn’t cost the earth when you shop with an Everything 5 Pounds discount code. With a huge range of stylish options, from cheery and colourful to cool and classic, everyone can find a bag to suit their summer style at Everything5pounds.